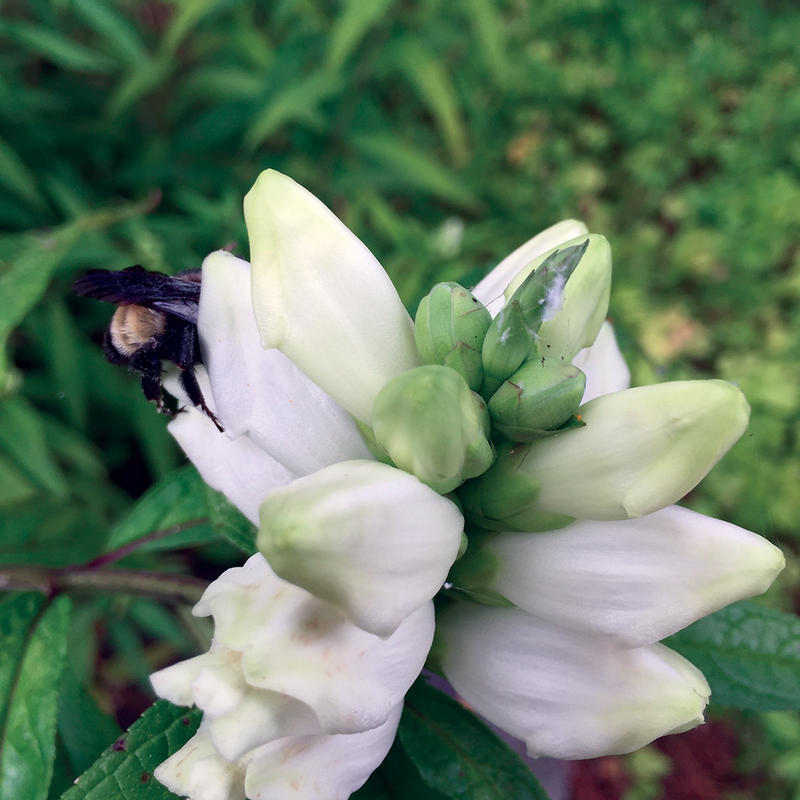 A bee feeding on the nectar of White Turtlehead, Chelone glabra. This plant is also a nectar source for butterflies and is a larval host of the Baltimore Checkerspot butterfly (Euphydryas phaeton). Photo by Trista Imrich. Photo cannot be reproduced without permission. Native plants attract a variety of birds, butterflies, pollinators, and other wildlife by providing diverse habitats and food sources. Native plants feed the insects that are the base of the food web, and insects that are especially important as food for young songbirds. Native plants also feed pollinators. We may not notice the hummingbirds, bats, bees, beetles, butterflies, and flies that carry pollen from one plant to another as they collect nectar, yet without them, wildlife would have fewer nutritious berries and seeds and we would miss many fruits, vegetables, and nuts. By planting a diverse palette of native plants, we invite not only the plant-eating insects, but also their predators as well as pollinators, seed dispersers, and recyclers, which work together to make a garden function like a system. Because our native plants and animals have evolved together, they support each other, and we enjoy the beauty and fruits of their labor. Butterfly Weed, Asclepias tuberosa, is a magnet for butterflies. Asclepias species are critically important larval hosts and nectar sources for the Monarch Butterfly (Danaus plexippus). Photo by Jan Newton. Cannot be reproduced without permission. A bee covered in pollen, feeds on Blue Vervain (Verbena hastata) flower nectar. Photo by Jan Newton. Cannot be reproduced without permission. With a simple, but profound, observation that nothing was eating the Multiflora Rose he was clearing from his property, Dr. Douglas Tallamy launched a line of research that has become a cornerstone of the native plant movement. He has shown that not all plants are of equal value to wildlife and that native wildlife prefers native plants. For example, native oaks support 532 species of native caterpillars, while the non-native Butterfly Bush supports only one. Caterpillars are important because they are the primary food source for nestlings of 96 percent of all bird species. This insight led to a call embodied in the title of his book Bringing Nature Home to share our suburban landscape with wildlife by planting native plants. One important aspect of landscaping for wildlife is a change in the status of turf grass. It is not that turf no longer has a place in your landscape, but it is high maintenance, high cost, and low wildlife value. Each square foot of turf should be examined and subjected to the question “Why?” Sometimes turf is the right cover, but that should be decided only after consideration of native plant alternatives like Pennsylvania Sedge, moss, or other materials such as mulch or stepping stones. The use of native plants in landscaping should not and does not preclude designing a landscape that meets your needs. Landscaping for wildlife should be a mix of human and natural design concepts. The overall plan should satisfy your needs—a place for the kids and dog to play and a quiet place to sit and enjoy your yard—and should follow human design concepts. But, the execution of the plan should be informed by nature’s design concepts: using plants in layers; avoiding straight lines; and smoothing forest into field into wetland. Above all: use a diverse array of native plants! Look for these icons in the regional native plant guides. The indicate native plant species that provide food and shelter for birds, butterflies and other pollinators and their larvae. As shown on the cover of the regional native plant guide for Southeast Virginia, a Goldfinch eats the seeds of a Blackeye Susan flower (Rudbeckia hirta; photo by Seig Kopinitz, John Clayton Chapter of the Virginia Native Plant Society), while a Eastern Tiger Swallowtail butterfly enjoys nectar from Garden Phlox (Phlox paniculata; photo by Jan Newton) and a bee feeds on the flower of a Buttonbush (Cephalanthus occidentalis; photo by Trista Imrich). 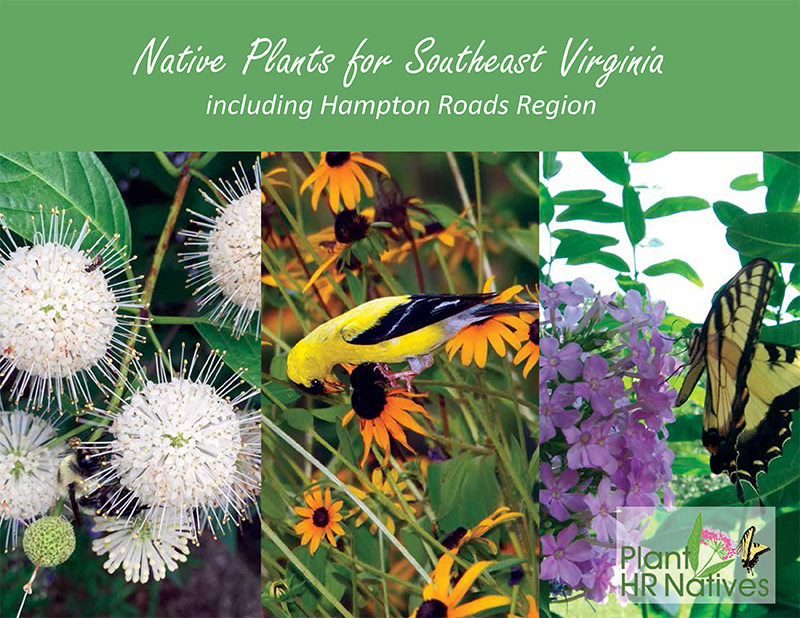 For more information about planting for pollinators, go to Learn More About Landscaping with Natives.